THANK YOU TO ALL WHO ATTENDED THE Fall 2018 TOURNAMENT! WATCH FOR OUR SPRINg tournament, coming soon!! Students may compete in up to 3 events, not including team forms. Boards for Board Breaking competition may be purchased at the event for $2.50 each. Students competing in Sparring must wear full Sparring Gear, including head protector, chest protector, and groin cup (for males). Please contact us with any questions. 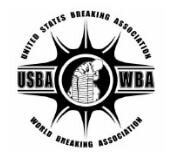 This year we are also hosting the USBA/WBA Breaking Event! American Martial Arts Academy and Moo Duk Kwan Tang Soo Do generally consider that we practice a martial art, not a competitive sport. This reflects the traditions and history of our masters and the evolution of TSD. Other styles of martial arts focus more heavily on the sport or competitive aspect. Although it is not the main focus of our school, tournament competition offers students the opportunity to challenge themselves, measure progress against other students, and develop their competitive drive and fellowship with other martial artists. In order to promote these values AMAA hosts two tournaments per year. These are held in the northern Detroit metro area, often at our Lake Orion AMAA location. AMAA students are all strongly encouraged to attend both of our local tournaments as a part of their learning and development. 6th gup students (green belt) and higher are required to attend and compete in at least one tournament per year as a part of their testing requirements.